If you are reading this before 5pm EST today then I’m probably still up in the air somewhere over the Pacific, desperately trying to get some sleep. Or maybe not so desperately. Last time I flew to Sydney it took me three tries to watch the Lego Batman Movie without nodding off, even though I’m not really sure that movie deserved so much effort on my part. But regardless of how the flying goes, I'm excited for a couple weeks of summer weather and pigging out at Sydney cafes. This sandwich here is not something I've encountered at any of the city's restaurants, but it feels like something that I could encounter, with just the right mix of comfort and quirk that I feel like I usually see on Australian cafe menus. All that's missing is an elaborate presentation on some kind of wooden serving board. I'll have to remember that for next time. 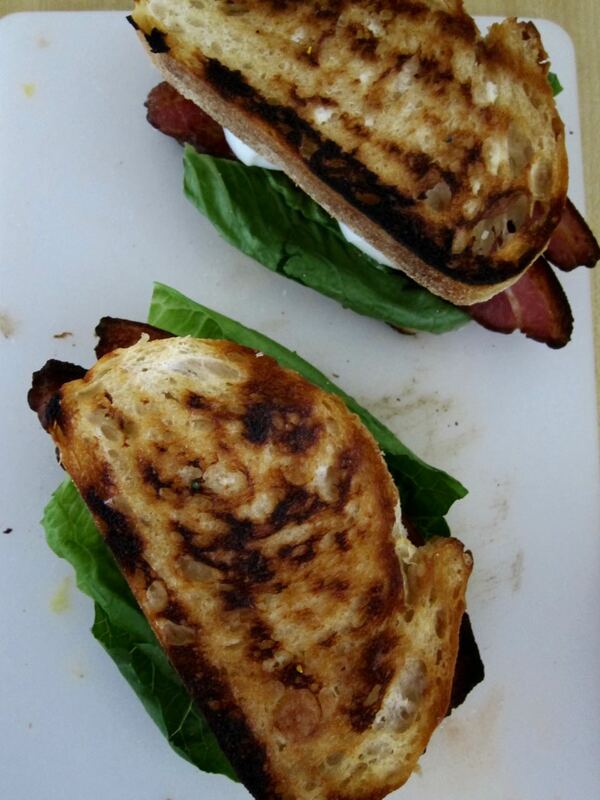 At it's essence, this is your standard BLT: bacon, lettuce, tomato, on sourdough spread with butter and mayo and then grilled. You go to the trouble of making some deviled eggs, then you promptly mash them in between the B and the L or between the L and the T (you decide). 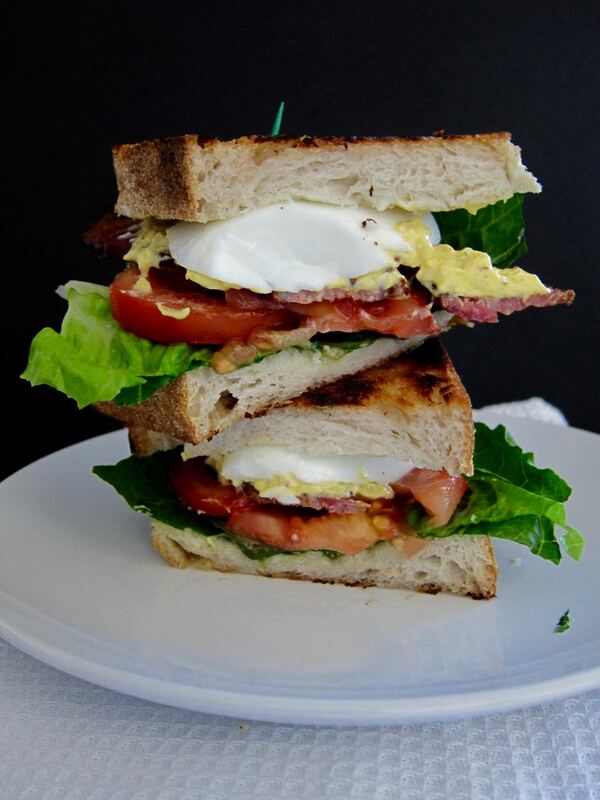 The end result is kind of like the love child between a BLT and an egg salad sandwich, and is extremely pleasant to eat, with contrasting textures of crisp lettuce, crunchy bacon, soft tomato and creamy egg. I don't think I really need to say anything more. Cook bacon slices as desired. I recommend broiling on a wire rack set in a baking sheet until crispy, flipping about halfway through. Devil eggs: Slice eggs in half lengthwise, remove yolks and add to a bowl with mustard and mayonnaise, mashing with enough of both to create desired consistency and flavor. Season with salt and pepper to taste (at this point you could add a little of the bacon grease and some jarred pickle juice if you want to get crazy). Spoon yolk mixture back into the whites. Toast the bread: Heat a cast iron or other heavy skillet over medium heat. Spread slices with a good amount of butter and a bit of mayonnaise and place buttered side down in the skillet. Toast until golden, then remove from pan. Repeat with any remaining slices. Assemble sandwiches and serve immediately. For those who plan their next meal while eating the last. Subscribe to Tea and Fog!